Parsley and cilantro are often listed as natural ways to chelate heavy metals and to detoxify. Although there are case studies that support the use of these culinary herbs to chelate metals, clinical trials do not back this up. However, there are still plenty of reasons to frequently include both parsley and cilantro in your daily diet as well as seasonal detox regimens. Parsley is potentially beneficial in preventing cardiovascular disease and thrombosis (thrombosis can lead to strokes and heart attacks). The herb contains compounds that have a potent impact on platelet aggregation (1). Eating parsley can increase superoxide dismutase and glutathione reductase. These are both enzymes that decrease oxidative damage in the body (2). Other studies have shown that parsley extracts will increase the overall antioxidant capacity of cells (3). Beside just looking pretty on your plate, when parsley is served with carcinogenic foods (think of charred and fried meat), it helps to decrease the carcinogenicity of the meal (4). The flavonoids in parsley are anti-cancer even when not served with fried meat (5, 6). Parsley acts as a diuretic (7). By helping to remove excess water, parsley can help reduce blood pressure and swelling due to water retention. This may explain the herb’s historical use in kidney stone prevention and cleansing. Cilantro decreases oxidative stress (8). It can protect DNA against damage (9). Cilantro can protect animal livers against hepatotoxic substances (10). More research is needed to confirm that this is also true for humans. Remember that the liver is one of your body’s primary emunctories and it is often overworked in our world. Cilantro is good for the health of your skin cells (11). Both parsley and cilantro are well-known for freshening the breath and improving digestion. 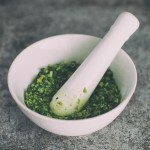 The pesto recipe below is a delicious way to get in more parsley and cilantro. It can be served tossed with a raw zucchini “pasta,” on baked spaghetti squash, or with chicken or fish. Put all ingredients in a food processor and pulse until desired consistency is reached. This pesto recipe is a delicious way to get in more parsley and cilantro as one tool for detoxing. It can be served tossed with a raw zucchini “pasta,” on baked spaghetti squash, or with chicken or fish. 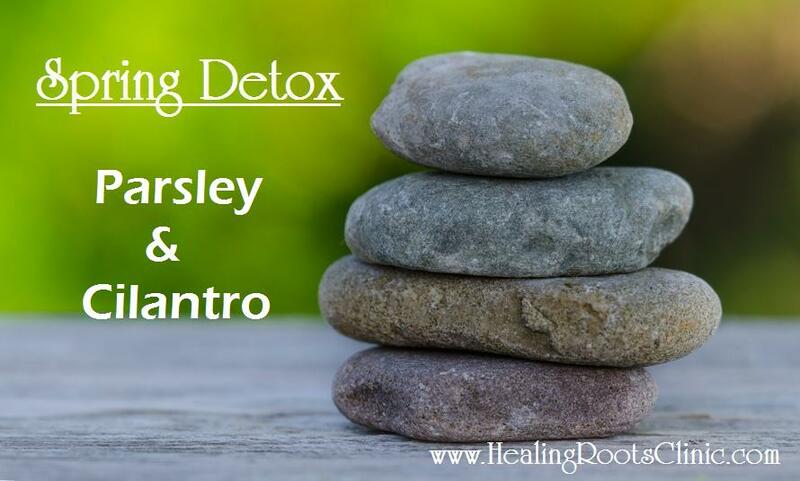 This entry was posted in Detox, Natural Medicine, Nutrition, Nutritious Recipes and tagged detox denver colorado, Detox Parsley Cilantro Denver Colorado, Detox Veggies Denver Colorado, natural medicine denver colorado, naturopath doctor denver colorado. Bookmark the permalink.